Google Analytics enables you to gain tremendous insight into your customers and how they use your website to make purchases. Using the built-in Enhanced Ecommerce features, you can track conversion rates, average order values, and other key performance indicators that you can use to improve your site over time. Once you’ve started using Google Analytics, you may run into a few hurdles. The first complaint we often hear is about information overload—there’s a lot of data to analyze, and it’s hard to know where to begin or what matters most. We also encounter clients who struggle with interpreting the data, because the built-in reports are not sufficient for their purposes. In this article, we’ll look at how you can make sense of Google Analytics data, and in particular, how Google Sheets can be used as a free alternative to expensive enterprise data analytics and reporting solutions. Google Analytics has made it easy to collect data by putting a simple code snippet on your website. But when you log into Google Analytics, it’s easy to be overwhelmed by the sheer number of reports, settings, and data points. The biggest challenge is making sense of these numbers, especially when it comes to determining what is most important for eCommerce. There are many built-in reports for product performance, sales performance, transactions, time to purchase, and other common metrics, but you’re limited in how you can view the data beyond these options. As your business grows, you’ll inevitably want to run some more customizable reports to glean insights. Google Analytics 360: Google’s enterprise analytics solution provides a lot more flexibility, but pricing starts at $150,000 per year, making it too expensive for many small to mid-sized businesses. Data Analysis Software: Tableau and other data analysis solutions provide greater flexibility at a more reasonable price, but they may still be overkill for small businesses, or simply too complicated. Google Sheets: Google Sheets, a part of the Google Apps family, is a free and highly flexible tool for performing data analysis, and could be a great starting point for small to mid-sized businesses looking to expand their analytics capabilities. Google Sheets provides powerful data manipulation and reporting tools for Google Analytics’ extensive data. 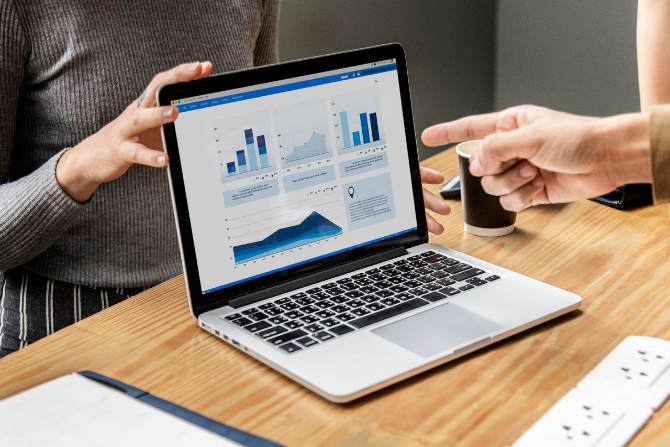 If you’re familiar with Excel spreadsheets, you will feel comfortable manipulating these data points by creating the calculations and visualizations needed to glean insights from your data. Query and manipulate data from multiple views. Compute and display custom calculations. Create visualizations and embed them anywhere. Schedule reports to automatically run and update. Control who can see the sheets with privacy features. The easiest way to integrate Google Analytics with Google Sheets is using the Google Analytics Spreadsheet Add-on. 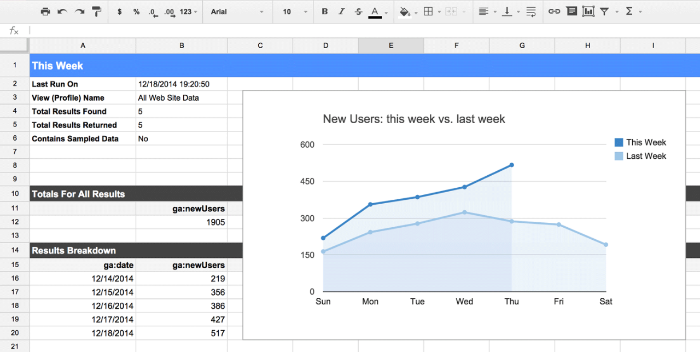 This add-on was created by Google to make it easier for Google Analytics users to access, visualize, share, and manipulate their data in Google Sheets without having to build their own integrations. 1. Create a new Google Sheet. 3. Search for the Google Analytics Add-on. 4. Click the “+” in the top-right corner to add it. 5. Click “Accept” to grant the required permissions. 6. Click on the “Google Analytics” submenu under the “Add-ons” menu to access the functionality. Next, create a report by choosing Add-ons > Google Analytics > Create a New Report. The report will serve as a starting point for further customizations. You can name the report, select the views you want to use, and then choose configuration options. If you have Enhanced Ecommerce enabled, you can also access all of those fields for Metrics and Dimensions. Finally, run the report by choosing Add-ons > Google Analytics > Run Reports, which grabs the latest data from Google Analytics in order to populate the Google Sheet. If you want to regularly run reports, you can schedule them by choosing Add-ons > Google Analytics > Schedule Reports. You can also provide other team members with access. Google Sheets provides expanded reporting and data visualization capabilities, but you still have to analyze the data to gain insights. There are also many traps that you can still fall into when analyzing the data, such as accounting for seasonality and product positioning when identifying your best selling products. Avatria Convert leverages machine learning algorithms to derive even more insights from your Google Analytics data while avoiding common pitfalls. Using this data, we can predict the products your customers are most likely to purchase. We have found that optimizing your categories to show the highest ranked products at the top of the page significantly improves conversion rates, per-session value, and average order value. In one customer case study, a small business was able to improve their conversion rate by 76 percent, per-session value by 161 percent, and average order value by 48 percent. Start your free trial today, and start optimizing your performance. Google Analytics is a great way to collect data to better understand your customers, but it’s only one piece of a bigger puzzle. By integrating Google Sheets, you can create customized reports that provide better insights into customer behavior—although you still have to apply those insights manually. Avatria Convert takes things one step further by turning these insights into actionable steps to improve your conversion rate and other e-commerce metrics. Using our solution, you can leverage your customer’s behavior data to make tangible improvements to your bottom line.